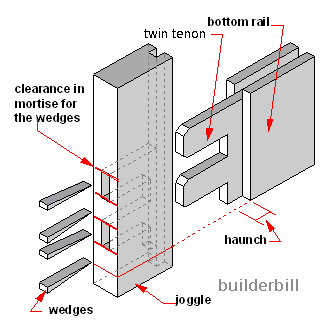 A tenon that does not run through the full width of the member, but it has a cut down section, the Haunch that allows the use of external wedge fixings. Used typically at the corners for doors and windows etc. Here are two sketches of tenons that have haunches. The reason for this is that the extra material left in the door style allows the standard external wedges to be used to hold the joint while and even after the glue sets. If we did not use haunches at the corners of mortise and tenoned frames, then the joint would not be anything like as strong. Note that when the door or window is being cramped and glued, that the door styles are left a couple of inches longer than would appear necessary. This extra length, known as Joggles is left on as long as possible to protect the door edge and also to allow the glue to really set. Some haunches, particularly in window sashes are beveled to nothing so that when the joggles are cut off the end does not show an sign of the haunch. So why have haunches anyway? They stop the rail from twisting. A narrow tenon alone may just allow the rail to twist.